A name like Pigeons Playing Ping Pong will get a band noticed, but they better deliver the goods then, right? "It's a crazy, silly name, but it has worked for us," says drummer Alex Petropulos. "The name itself puts out a vibe and makes people say, 'Oh what is this?' It's fun." In addition to Petropulos, the remaining band members are Greg Ormont and Jeremy Schon, vocals, guitars; and Ben Carrey, bass, vocals. The band returns to town Tuesday, Feb. 12, for a show at Songbirds South. They played a rollicking set at Bonnaroo last year, where the band got to show off its jam improvisational skills to new fans, Petropulos says. It was the first time at the festival for all but Jeremy Schon, who was inspired enough by his experience at Bonnaroo a decade ago that he started Domefest, which the band now hosts in West Virginia. Petropulos says he and his bandmates appreciate what festivals have to offer, which is the chance to see cool acts, but also to play in front of potentially new fans. "We'd all heard of it, but none had attended," he says of Bonnaroo. "I look forward to festivals that have a good mix because you know you are going to get some new ears and fans. We love to see the diehards there that we see at all of the shows, but it's also great to see new people." The band's live shows are a whirling, swirling blend of funk grooves, psychedelic jams and experimental electronics. The Baltimore-based band's new album, "Pizazz," comes close to portraying that live experience. Pigeons Playing Ping Pong have been a jam-band favorite for almost a decade. 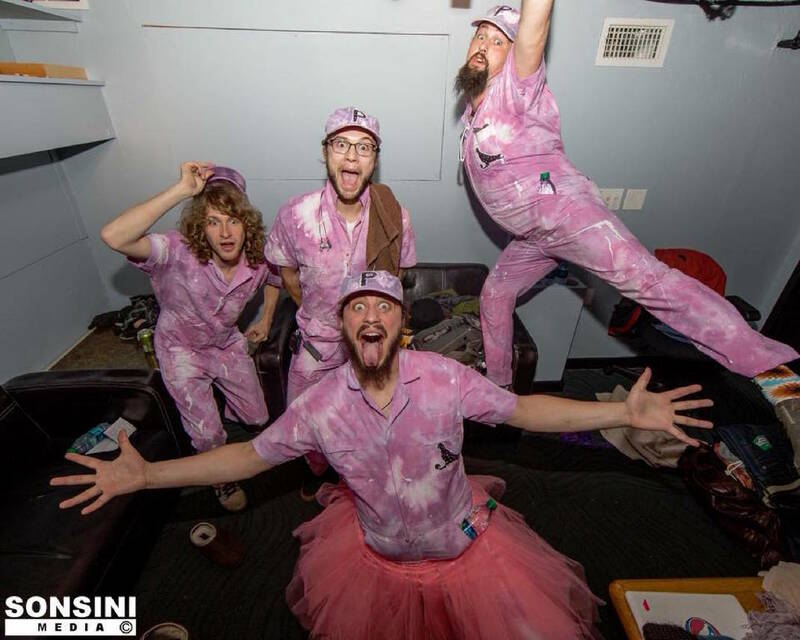 Glide Magazine called them "a band that melts faces and pulls no punches," while C-Ville Weekly praised the growing "cult around [their] high-energy music, goofy stage antics and all-around good vibes." JamBase raved that guitarist/vocalist Jeremy Schon is "destined to become one of our generation's finest guitarists." Each of the four band members are aces on their instrument who love to improvise and go where the music takes them. Most of the best jams are never planned, Petropulos says. "You can't really do it that way. The crowd, the moment, the song just all have to be right. We did one show where the whole second set was one song for 50 minutes. We didn't plan it."